It is late August in Montana. The early summer hatches of stoneflies, mayflies, and caddis are in the rearview mirror. While things seem to be quiet on the river, the fly fishing is as good as it gets on our Bozeman, MT home waters of the Yellowstone River, Madison River, Missouri River, and Yellowstone National Park. Some of our best days of the year happen in late August when flows are low, rivers are clear, and the hatches are thin. How do our Montana fly fishing guides keep the bite alive when the dog days of summer set in? Look to the banks for our trout’s favorite late summer food source: the hopper. While the hatches of mayflies and caddis may be thin on our rivers in late August, the banks are alive and loaded with tasty trout snacks. Hoppers are generally the crowd favorite and consistently catch great trout from late-August through late-September. They come in all shapes, sizes, and colors. Pick your favorite but don’t be afraid to rotate through a few different patterns if the trout don’t go for your first offering. And twitch it. While hoppers account for the lion’s share of fish caught by terrestrials during our late Montana summers, don’t count out the humble beetle and ant if the hopper bite slows down. Even the wariest of brown trout can’t resist a well presented beetle. By late August the trout on the bigger and more popular rivers have seen a few flies. That big ‘ol chubby chernobyl that knocked them dead in mid-July may not turn as many heads by the end of August. Late summer is the time to mix it up and show the trout something different. Sometimes this means going bigger and bolder and sometimes smaller and duller. Great time to try those odd-ball attractor patterns gathering dust in the corners of the fly bins. You might just be surprised to find they work well. Really well. And when it comes to color, go crazy. 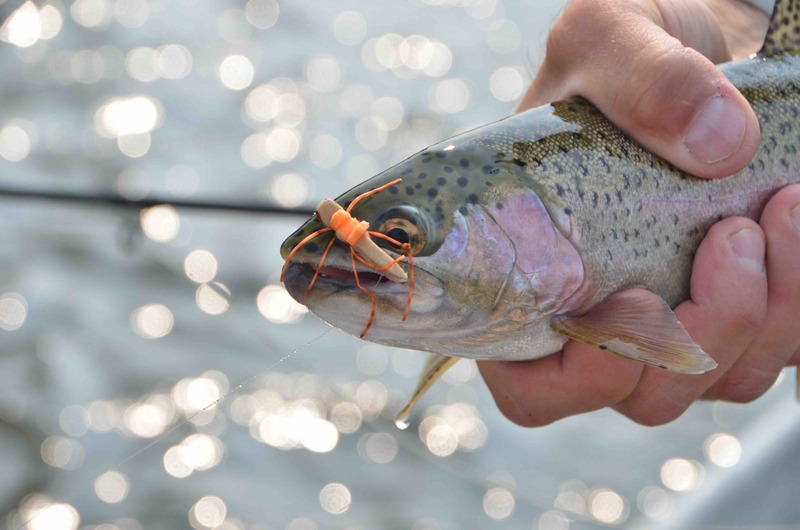 Our Montana fly fishing guides will fish hoppers in practically every color of the rainbow. And some not in the rainbow. Pink, purple, orange, red, black, green, and yellow all account for their fair share of trout. It pays to be different. Late-summer’s lower flows and clear water mean spooky trout, even on our larger rivers like the Yellowstone River and the Missouri River. Good time to get sneaky. 3x to only the biggest flies and 4x to 5x on the rest. 5x to 6x on our tailwater rivers. Consider tying on some extra tippet too. On the brighter days we commonly will fish smaller dries, size 14-18, on long leaders, 12-14 feet. Our trout don’t like seeing fly line. Keep it as far away from your fly as you can. It’s also a good idea to give trout a little more breathing room when the sun gets high. This means keep your distance from your target wade fishing and keep your fly away from the oars float fishing. Give them what they want, make it as easy as possible for them to eat, and good things will happen. And wade. Late-summer in Montana means flows are perfect for fishing even the biggest of rivers by foot. Leave your waders at home. Wet wading will bring you back to the good ol’ days. Just you, the river, and your fly. Hard to beat this simple pleasure. The Lamar Valley in Yellowstone National Park is home to some of the finest late-summer wade fishing in the area. Head that way and enjoy fly fishing for cutthroat trout on one of the many tributaries of the Yellowstone River. The Lamar River, Slough Creek, and Soda Butte Creek are the popular picks and for good reason. Stay closer to home and get your feet wet on the Gallatin River or the Madison River. Wade fishing is good for the soul. Happy fish are feeding fish. Fish to them! Late summer means that our trout have spread out. Look to moving water that is rich in oxygen. Riffles are the obvious choice. Late summer is the time to move away from the banks and look to mid river structure for fresh holding water and eager trout. Find a trout and continue to target water like it. Look to the harder to get to spots to consistently find larger trout. Under the tree branches, micro-pockets, and bottom scoops can all hold better fish. Late summer is the time to fish harder and smarter if you want to keep the bite alive. And don’t forget to have fun!